The third episode of the Overdraft: The Orion Offensive serial is out this week — download it here — and I have made updates to bring the Overdraft Glossary and the Overdraft Timeline up to date for the current chapter. But I thought I would quickly share a look at the making of the cover. The first working title of Overdraft was Surge Sigma, after the team of bodyguards that Bridget Yang runs; they were the first characters introduced in the series, back in "Human Error." 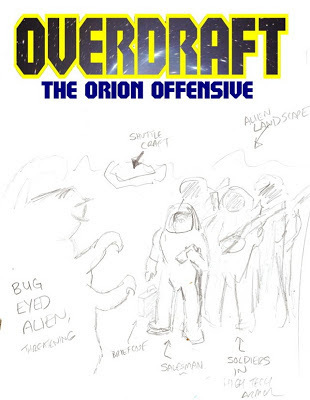 Agreeing that Overdraft was snappier and spoke more to the situation in the story, we made the title change fairly early on — and I provided publisher 47North some ideas for the cover. I had wanted to do something very pulp-oriented, with perhaps a fun echo to the original cover of the classic Merchant of Venus game. I provided a pencil sketch of what I had in mind, placing it underneath a home-brew logo for placement only. As it turns out, artist Paul Youll produced a wonderful piece that used exactly that idea, right down to where everyone was standing and where the shuttle was. That was pretty cool for me to see — in all my years writing comics, I've certainly provided guidance for artists, but almost never when it comes to suggesting cover art. (Iron Man #78 was one of the few exceptions where I suggested the cover.) I think Paul did a fantastic job. The logo, meanwhile, was crafted by 47North's art department. I'm thrilled with how it all came out! 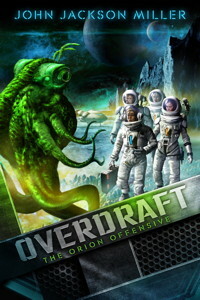 The fourth episode of Overdraft releases on May 14. Be sure to check it out! Star Wars: Kenobi cover released! Star Wars: Kenobi -- the promo copy!